Today my creativity is strictly limited to cleaning my studio so that the CQTeers group can have our meeting tonight. I've even re-arranged some furniture which is where the 'sneeze' part of this post comes into play....we were sure we only have 2 cats, so how come I found enough fur for at least 6 underneath one cabinet (which obviously hasn't been moved for awhile). Cosmo is in heaven because I found his long-lost mouse. The picture is of the fabric I hauled out of that murky mess in the bucket. It came out rather insipid looking and I was quite disappointed. However, when I laid it out on the driveway to dry it promptly turned incredible. I don't know if you can see in this picture too clearly, but on the left is a tightly rolled piece of fabric (around a big spring and held in place with elastics). I'm not unwrapping it yet, although the suspense is killing me!! I've been meaning to point you toward a new blog I have discovered. 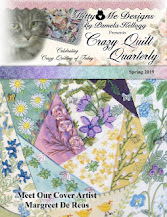 Carole Samples (of 'Treasury of Crazy Quilt Stitches' book) has a new blog at http://myheartsfancy.blogspot.com You might want to check it out. Just look at the murky mess in the bottom of my bucket...isn't it beautiful? No? Well then, it's easy to see that you have no appreciation for the finer points of rust dyeing! Remember the picture of the rusty springs I got from my BIL I posted a few days ago? They're in here, wrapped with fabric along with a bunch of rusty nails and assorted gee-haws I liberated from the workshop in the garage. I can't wait to see what this produces!! Further on rusty dyeing - there's an article on that very thing in the latest issue of Quilting Arts magazine which came today. The artist that wrote the article does hers in a slightly different way (instead of percolating the fabric and the rusty 'bits' together, she simply wets the fabric with vinegar, wraps it around rusty objects and then allows it to dry). I'm going to try her method too and see which I prefer. The men-folk in my household think I'm somewhat 'teched' in the head! p.s. what's with all the comments about the fire department yesterday...huh??? WHY would I ever give the impression that I might manage to burn the house down? Hurumph. #597 - Prototype 2 and Windfall!! Here is my second effort at a knitting bag and I'm much happier. I've increased the height to about 15" which is approximately 3" more than the original. I revamped the pockets on the outside so that I can carry either a book or magazine on the outside. The pocket where you see the knitting needles in the picture will hold a separate needle roll which I'm in the process of creating now. I really think this bag will work, but it's not something I will be producing a bunch of!! Just look at what I got today - a huge roll of something that is exactly like tyvek, but another brand name. The roll is 36" long and is black rather than the usual white that tyvek comes in. It shrinks/melts wonderfully so I'm a very happy camper. There's fun, fun, fun to be had with this! Thanks Calvin!!! I ended up with my needle rolls being on inside out, but that didn't bother me as much as the fact that the needleholders are simply not practical. The section for long needles is good, but the shorter ones are not going to stay in the allotted spots. The whole bag is altogether too floppy, despite being made from denim and being fully lined. I had thought the needle rolls being attached to the outside of the bag would be an asset, but now I have them there, I don't care for it. I would rather have them be separate or perhaps be attached to one of the side pockets. Needless to say, this will not be a repeated project!! Again, I can't show you yet what I've been working on so here are some more flowers from our garden. I love these perennial sweet peas; this year they are over 6 feet tall and smell wonderful. I have been wrestling with my sewing machine today and have finally come to the conclusion that I need a new throat plate. My upper thread seems to be shredding and breaking and it's not the tension and it's not the thread and it's not the needle. I've cleaned it thoroughly and while I was doing that I noticed a burl on the plate where the thread & needle go through, so I expect that might be the problem. Argh. Not only that, I attempted to update a spreadsheet for the Exquisite Corpse group and mucked it up....hence my being hot under the collar!! Even the cat exited my studio upon hearing the *language* being uttered. Can't say as I blame him either. I wonder if I shouldn't just crawl into a hole for the day!! Sorry folks, no pictures today because it was one of those 'spin your wheels' days and I didn't accomplish a darned thing (unless you count sweeping the floor and I don't think you want a picture of that!!). The newest issue of the CQMag is online at http://CQMagOnline.com and some of my work is in the Reader's Showcase, along with some pretty cool work by other people. As always, there are some excellent articles in the mag. It's well worth checking out...and....it's free!! This is post #594 and I'm thinking about what my giveaway/contest for #600 will be. This time it's not going to be a simple giveaway...you're going to have to work for it!! There's nothing I can show of what I've been doing today, so I give you a picture of one of the roses in our garden. 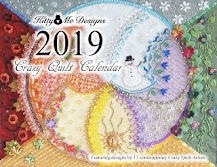 I also have an interesting site for you if you're interested in doll making: http://www.designsbykat.blogspot.com Thanks to Dollmaker's Journey for the heads-up on this one. AND...I'm closing in on 600 posts and there just might be a give away. Stay tuned!! Look at what my BIL brought me on the weekend! I can't wait to play with them and hope to put them on to cook tomorrow. Stay tuned to see what happens!! ......Christmas in July!!!!! Just look at the wonderful goodies that came in the mail today from Arlee! I am so very lucky to have met cyber-friends like her. The first two pictures (which I managed to post backwards..duh) are of the page she made for me to include in my 'Coffee or Tea' beverages cloth/paper book. The first picture is the back of the page and there's a little packet of coffee on the left...which smells wonderful! And one of Arlee's poems too. This is the front cover and (as we love to tease her about) this lady looks just like Arlee! It seems that pretty much every person Arlee creates in her art ends up looking very much like Arlee herself - hence the teasing. I don't know if you can tell in the picture, but her hair is highlighted with coffee grounds. Several months ago we did an exchange for the Art-In-A-Carton challenge ( http://art-in-a-carton.blogspot.com ) and the next two pictures are of the carton Arlee made and of the goodies that were included inside. No recycled milk cartons for this girl - this is all created by Arlee! Be sure to enlarge these pictures so you can see the details. See the bird and the Dottee doll? More of the goodies that were stuffed in the carton (and another side of the carton for you to see). And...to make it even more fun...just look what else was included in the box!! At the top of the picture (flash made it glare too much) is a sparkly piece of copper tissue paper (yum). There's a piece of painted & distressed tissue; some of her painted/dyed fabrics; a wee little box; some flower-y fabric and some lace; AND an aluminum water bottle!!! All of this wonderfulness was for moi...who's feeling pretty darned blessed right now. Christmas in July? You bet!!! Have a look at what came in the mail today - all the way from Doreen in Australia! You have to click on each of these to enlarge so you can see how beautiful they are. If you remember, Doreen and I arranged to do an exchange where we would each piece a block and send it to the other for them to complete. This is what I received back from Doreen and am absolutely thrilled. She does beautiful work! See the cute little stork scissors? And the rectangle MOP button? And the sweet little spider and his web? These were in the envelope too! I'm pretty sure the flower button is hand-painted and that it's made of porcelain...beautiful. There another of the rectangular MOPs (I've never seen that shape here). The other button (which didn't want to photograph well) is perfect and will be put away with some little playing cards I have for a future project. And laces too! Just look at the intense colour of the blue flowers (I love blue). The lovely butterfly and the fans and flower baskets. Thank you so very much Doreen. I love it all! Can you tell that I have had a totally unproductive day? Some days are like that and you feel like you have spent more time spinning your wheels (literally) than doing anything else. My worktable has gone from being relatively clear yesterday (only because a friend was coming!!) to being a total slovenly mess inside of a day. Now...how did that manage to happen when I haven't been home long enough to even spend 5 uninterrupted minutes in my studio?? It's like those blasted dust bunnies that keep multiplying under the bed and rolling across the floor like tumbleweeds - usually when you have company and get totally embarrased, because of course there are never any dust bunnies in THEIR house. At least one good thing...I didn't get time to try to burn the house down today. It's a fight to the death..and fire alarms? These two pictures are of our vegetable garden where we are fighting a losing battle with earwigs who are determined to eat the produce before we can get a chance at it. Miserable little creatures! Not only that, they look scary too. They remind me of scorpions (which we don't have here). We feel as though we're under seige. As for the fire alarm. Well. Umm. One shouldn't try using the heat gun in the basement...maybe? At least we know the smoke detectors work. All that excitement only to find out that what I thought was tyvek...isn't. Argh. oh yeah...and don't yell at me about poisonous fumes 'cause I know all that. It was just a LITTLE piece of 'not'-tyvek. Here is my finished Take It Further challenge piece of July. Again, these are colours I maybe wouldn't have chosen on my own, but I have loved working with them. Sharon stretches my imagination with these choices and I am enjoying this year long challenge so much. The following two pictures are of a mystery plant my neighbour gave me over two years ago. This is the first time it has flowered. I was hoping it would identify itself when it did, but I still have no clue what it is. I have waited over a week for something else to happen with the flower, but here it stays. Anybody know what it is?? Look at what I was lucky enough to get today...three magazines to add to my collection. I love the Somerset magazines and wish I could afford to buy them all! The Needle Pulling Thread is a Canadian magazine and generally has a few interesting things in it. I like the fact that the ads are mostly Canadian so it's a good one to find sources. Our other purchase (from our yard sale earnings) was a Dyson upright vacuum. Our old one has been limping along for a couple of years and with two cats & two dogs in the house we need something with some ooomph to it. #1 son will benefit from the whole thing because he will 'inherit' the old one. The yellow part of this post is pretty self-explanatory! I did a little bit on my TIF piece today, but not enough to bother showing you. I'm hoping for better things tomorrow. I don't know if I posted about these two mail order sites before and, if I have, my apologies. Both of these places are Canadian, which is a bonus and they are very good to deal with - at least in my experience. Both have extensive web sites, but also produce paper catalogues. First is 'Stockade' (www.stockade.ca ) . There's not too much this company doesn't carry and they keep adding new products all the time. It's well worth checking out their site to see what they have. Second is 'A Great Notion Sewing Supply Ltd.' (www.agreatnotion.com) Again, a great resource for all sorts of things pertaining to sewing and such. I get my silk ribbon from them. This first picture is of my gleanings today. The flock of butterflies (do they call groups of b'flies flocks?) came in a package from the dollar store. They're made of some sort of fabric. The earrings & brooch came from the thrift store...heaven forbid I should go to drop a bunch of stuff off and not come home with something too!! Don't get excited because I'm not about to wear those earrings - they're fodder for something artsy. As I mentioned, I had a learning experience today - thanks to Arlee. I've been grousing about my camera and haven't always been happy with the colour of my pictures when they get to the blog. She very nicely pointed out that perhaps I should look into adjusting them in the photo program. Well. Duh. It's like when you leave the hoe laying on the ground and then wonder why, when you step on it, you get clunked on the head. The wonders of technology - who knew!! I thought I'd talk a bit about my working process on a block (at the risk of boring a large percentage of my readership). I'm not particularly organized when I work as you can see by the evolution of my blocks. I know a great many people work all their seams, then all their centres, and then add the beads, buttons, etc. I don't. I get bored and jump all over the place working on whatever pleases me at the time. I add the beads and such as I go along, even tho' there's a certain amount of angst when the threads get tangled around them. I don't hoop my work and find that works best for me. Some people can't work without one, but it just gets in my way. I tend to use a lot of tissue paper for patterns (I make an outline of the area I'm wanting to fill and then sketch out a pattern, pin it on, and sew through the tissue). A pair of curved tweezers work nicely to remove the paper when I'm done. I also use waste canvas in some areas and when I want to be sure a seam is even I will use a piece of 1/4" masking tape as a guide. I just make sure I remove the tape as soon as possible, or it can leave a sticky residue behind. Sometimes I don't use any of my props and just simply wing it. I also use a layer of heavy interfacing behind any areas that have a lot of weight (ie. the button clusters) for additional stability. Hope you enjoyed reading about my working process! For some reason this block just does not want to be photographed, so you will have to click on it to see the details I added today. The seam treatment at the top is one from Pam Kellog's Elegant Crazy Quilt Seam Treatments book, worked in embroidery floss and with a bead to give it a bit of sparkle. The second seam (just below the patterned fabric) is also from Pam's book but I chose to use just part of her treatment in order to make it fit in the area I had. I also added some pearl beads (antique ones, I think) for highlights. Here's a couple more pictures of flowers from our garden. There are so many beautiful ones in bloom right now and it's such a treat to take a stroll through our property. Enjoy! Today I found some time to work on my July TIF piece and here you can see the progress. The lace seam treatment is a piece of antique lace that was (tah-dah) JUST long enough to cover the seam. The green flowers on the lower right were a re-make after I had fussy-cut a violet from fabric and appliqued it down. When I looked at it afterwards, I decided that the purple in the violet was just too 'off', so I removed the flower and replaced it with the green beaded one. Much better!! This next picture is something that Jack unearthed in our front flower bed. At one time there must have been a tree there because we're all the time finding mushrooms and now this. Intriguing isn't it? Finally, this is a picture of the buttons we made at CQTeers last month, under the able guidance of Sue. Hopefully enlarging the picture will show the details better. One of these will end up on a CQ square at some point. Because I'm never quite sure in which order Blogger will publish these pictures, I'm going to have to guess at it. Hopefully the first two pictures you see will be of the catalpa tree and a close-up of the blooms. Jack started this tree from a seed and this year it is absolutely beautiful. I *think* the next picture you see should be of the two atc's I received in the mail recently (both are orange/red tones). The top one is by Corryna and the bottom one is by Emmy...both are thank you's for my work on their Exquisite Corpses. I think I got the better end of the deal. The remaining pictures are from the atc exchange we have each month in our CQTeers group. The fish, sillhouette hand, and flowers are by me (bottom picture you will see). The flower background is from the freebie Allison Aller posted on her blog ( http://alliesinstitches.blogspot.com/ ) and I've called it 'Allie's Garden'. The three that have the 'Ah...Fresh Air included are by Sue (our resident expert in paper). The singing bird is by Kym and the remaining two are by Irene who used her embellishing machine for the flowered one and an exeedingly clever use of maple keys to make fishes!! Enjoy! I had the best of intentions to show you some atc's I've received recently, but as per usual - I forgot to charge the camera. Instead I give you some more flowers from our garden. The mock orange blossoms smell so heavenly - I love them. The other picture is a close-up of another of the poppies we have. Tomorrow I hope to take a photo of the catalpa tree which is in full glorious bloom. Jack started the tree from a seed several years ago and he's quite proud of it. I stumbled upon a very interesting site and thought I would share it with you. http://tipnut.com has a whole lot of information on a whole lot of subjects and is well worth checking out. Another one I found is http://unclutterer.com Anyone who knows me is well aware of my compulsive reading of books about organization. I find them fascinating for some weird reason. I almost hate to admit it!! Wonder if there's a 12-Step program for my disease? While I'm on the subject of clutter - there's a really good book I just finished reading and I highly recommend it if you feel you need some organization. 'It's All Too Much - An Easy Pan for Living a Richer Life With Less Stuff' by Peter Walsh. He is the host of the show on TLC called 'Clean Sweep'. The book is quite humorous and gives you great techniques that are simple to execute. We have a ton of these beautiful single poppies around our house...almost makes me feel like we're living in Flander's Fields! They self-seed every year so we don't have to do a thing. They're the first thing I see when I open the bedroom curtains in the morning. The other picture is my 'nekkid' TIF piece for July. The colours aren't true here, but you can get the general idea. I really had a challenge to find the colours in my stash this time and I know there are a couple in here that aren't spot on, but I promised I would buy nothing for this challenge and I'm trying very hard to stick to it. If you would like to see the actual colours check out SharonB's blog entry for July 1st ( http://sharonb.wordpress.com ). Today I've been busy working on the my area of the last piece of round one of the Exquisite Corpse challenge so I can't show you what I've been up to. Instead I thought I'd show a couple of pictures from our garden. The love-in-the-mist are one of my favourites and I look forward to them blooming every year. Aren't they pretty?